There are times when being seen to listen to music through headphones might get you into trouble. For these moments, reach for a handy solution: bone conduction speakers that discreetly pipe the music to your eardrums through the bone of your skull. 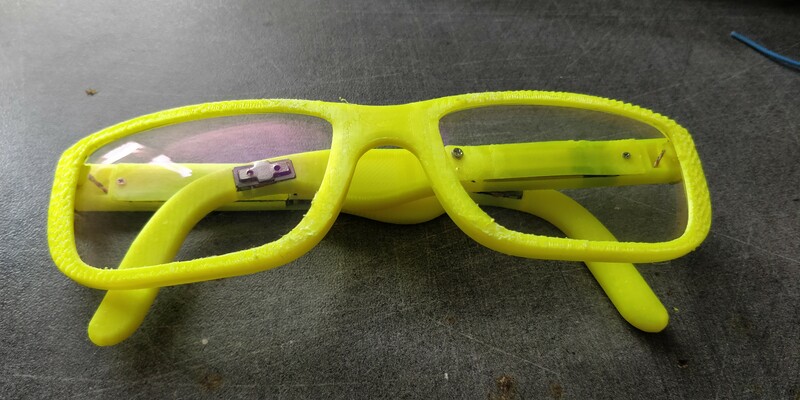 [Samuel] wanted just such a covert music listening device, so created his own in a set of 3D-printed glasses. He first tried using an Adafruit bone-conducting transducer but found that to be too bulky. What you see here is a smaller module that [Samuel] found on AliExpress (search for bone conduction module). The GD-02 is much smaller and thus more suitable for hiding in the arm of a pair of glasses. For the rest of the electronics he used a PCB and battery from a donated set of broken Bluetooth headphones, a space for which he was able to conceal easily in the 3D-printed frame of the glasses. The battery is in one arm and the board in the other, and he says the wiring was extremely fiddly. The result is a surprisingly svelte set of specs that you might not immediately think concealed some electronics. His choice of bright yellow filament might give the game away, but overall he’s done a great job. This certainly isn’t the first bone conduction project we’ve shown you, some of the others have used motors instead of bone conduction transducers. The Compact Disc is 40 years old, and for those of us who remember its introduction it still has that sparkle of a high-tech item even as it slides into oblivion at the hands of streaming music services. We (and by extension, you) have seen the Raspberry Pi crammed into nearly every piece of gear imaginable. Putting one inside a game console is to popular it’s bordering on a meme, and putting them into old stereos and other pieces of consumer electronics isn’t far behind. It’s always interesting to see how hackers graft the modern Raspberry Pi into the original hardware, but we’ll admit it can get a bit repetitive. So how about somebody scratch building an enclosure for their jukebox project? There was a time when any hi-fi worth its salt had a little row of sliders on its front panel, a graphic equalizer. On a hi-fi these arrays of variable gain notch filters were little more than a fancy version of a tone control, but in professional audio and PA systems they are used with many more bands to precisely equalise a venue and remove any unwanted resonances. Sometimes a mix of old and new is better than either the old or new alone. That’s what [Brad Carter] learned when he was given an old 1990s sound board with a noisy SCSI drive in it. In case you don’t know what a sound board is, think of a bunch of buttons laid out in front of you, each of which plays a different sound effect. It’s one way that radio DJ’s and podcasters intersperse their patter with doorbells and car crash sounds. Even though it’s now a forgotten afterthought in the history of broadcasting technology, we often forget how innovative the TiVo was. All this set-top box did was connect a hard drive to a cable box, but the power was incredible: you could pause live TV. You could record shows. You could rewind TV. It was an incredible capability, that no one had ever seen before. Of course, between Amazon and Netflix and YouTube, no one watches TV anymore, and all those platforms have a pause button, but the TiVO was awesome. Ultrasonic phased arrays are one of the wonders of the moment, with videos of small items being levitated by them shared far and wide. We’ve all seen them and some of us have even wondered about building them, but what about the practical considerations? Just how would you drive a large array of ultrasonic transducers, and how would you maintain a consistent phase relationship between their outputs? It’s a problem [Niklas Fauth] has been grappling with over the three iterations so far of his ultrasonic phased array project, and you can follow his progress on the latest build. There’s a lot of fun to be had in modernizing an old boombox but what about turning one of those ubiquitous shelf speakers into a portable boombox, complete with a handle for carrying? That’s what [GreatScott] did when a friend gave him a just such a shelf speaker. [KaZjjW] wanted to retrofit a pair of nicely styled vintage headphones to be able to play wirelessly over Bluetooth. In principle this is an easy task: simply stick a Bluetooth audio receiver on the line-in, add a battery, and you’re all set. However, [KaZjjW] wanted to keep the aesthetic changes to the headphones at an absolute minimum, retaining the existing casing and volume control, whilst cramming the electronics entirely inside and out of sight. [Audio] Inventor of The So-called "Wearable Computer"
[Audio] Cult of the Dead Cow - BO2K! Abstract: What will we be doing? R0xiN the HAU-aus, BIzaTch!!!@@!2121lf... But that goes with out saying. In addition to the rocking of the aforementioned house, we will also be releasing BO2k. We won't reveal our sekrets of BO-Fu, but trust me when we tell you that it will make BackOrifice v1.0 look like LOGO for the TI99/4a. Abstract: From the Hacker Jeopardy winning team. He will discuss Issues with Security and Networked Object Systems, looking at some of the recent security issues found with activeX and detail some of the potentials and problems with network objects. Topics will include development of objects, distributed objects, standards, ActiveX, corba, and hacking objects. [Audio] Security Auditing + Panel of Oscar Meyer, Mel, Bin High? [Audio] Carefully Consider Your intentions Before Embarking Down The Road of Serious Hacking. How far are you willing to go? [Audio] Anti Virus Programming, or, "Cleaning Up After Other People's Messes"
Abstract: Presentation of the attack against Argus Pitbull describing some technical details. [Audio] How extreme is eXtreme Programming? Abstract: Few new technologies have so polarized the computer world in the past years as much as eXtreme Programming has. Is it a new breakthrough in methodology, or just hype? This talk presents the basic principles and practices of eXtreme Programming, lets you ask questions, and gives you the chance to decide for yourself. Abstract: SPAM is a growing problem that is hard to fight. On the one hand you want to communicate with everybody, on the other hand you don´t want to be filled up with SPAM. To fight spam effectifly there are some server and clientside solutions which help and put some mails into the trash by their own. [Audio] TCPA - resistance is futile? Abstract: The final get-together looking back at three days of genuine hacking experience at bcc. 21C3 tried to reinvent the Congress in a couple of ways. Did we succeed? Could we do better? Of course we can, but looking ahead to 22C3 should bring us finally on the road to a true international event that serves the community as one of the best and funniest events on this planet. Abstract: IT will be shown how IPv4 based protocols can be used to tunnel data through Firewalls while maintaining RFC compatibility. The goal is to show a broad spectrum of techniques. However, a few examples are presented in more detail. Abstract: Current Honeypot-based tools have a huge disadvantage: Attackers can detect honeypots with simple techniques and are to some extent also able to circumvent and disable the logging mechanisms. On the basis of some examples, we will show methods for attackers to play with honeypots. Honeypots / Honeynets are one of the more recent toys in the white-hat arsenal. These tools are usually assumed to be hard to detect and attempts to detect or disable them can be unconditionally monitored. The talk sheds some light on how attackers usually behave when they want to defeat honeypots. We will encompass the process of identifying and circumventing current honeypot technology and demonstrate several ways to achieve this. The focus will be on Sebek-based honeypots, but we will also show some ways how to accomplish similar results on different honeypot-architectures. Upon completion of this lecture, the attendees will have some insight in the limitations of current honeypot technology. Individuals or organization that would like to setup or harden their own lines of deception-based defense with the help of honeypots will see some constraints on the reliability and stealthiness of honeypots. On the other side, people with more offensive mindsets will get several ideas on how to identify and exploit honeypots. Abstract: A technical introduction to Ciphire Mail, a new email encryption solution. We will discuss the design, concept, and technical aspects of the system, and demonstrate how usability, security, and trust mechanisms are improved. Abstract: Overview about the young and still developing Free Software scene in South and Latin America (mostly Brazil), ways to achieve independence of existing structures, and some specific projects. While in Germany people still talk about the ongoing partial migration in Munich, which is mostly in the hands of only few companies, other places have advanced some more already: where interested citizens are part of IT migrations in both companies and organizations. Not only is this a cultural difference, but also gives all hackers the possibility to block decisions heading the wrong way, and to integrate their own perspective. Abstract: More and more devices like wireless access points, personal network storage servers or satellite decoders are powered by Linux. Some vendors are even publicly distributing the (base) source code for their products. This session will show the details of embedded Linux and how you can change these devices to your own needs. Abstract: Please join us as we look back to what happened and look forward to what's next on our agenda. Abstract: This talk will introduce new strategies for dealing with entire bug classes, and removing bug attractors from development environments. Abstract: An impressionistic overview of what makes the difference today and in the future (in the digital playground) in the balance of power between economic and military powers. The presentation will also cover a description of the business behind espionage worldwide as well as the asymmetric organizations that are the real master of puppets. WordPress Tierra Audio third party plugin suffers from full path disclosure and directory listing vulnerabilities. Note that this finding houses site-specific data. Abstract: I will discuss new experiences and potential directions involving scanning massive networks, such as the entire world's DNS infrastructure. Our networks are growing. Is our understanding of them? This talk will focus on the monitoring and defense of very large scale networks, describing mechanisms for actively probing them and systems that may evade our most detailed probes. We will analyze these techniques in the context of how IPv6 affects, or fails to affect them. Abstract: We are giving an overview of ip networks used for >=2.5G technologies. Our main focus is on scanning the overlaying ip network, on different Voice-over-IP filter implementations and the possibilities to circumvent them. We want to explain the ip networks used in GPRS and UMTS cellular networks from the enduser point of view. How do they work today and what has to be done to get a normal webpage, voice-over-ip or even a video stream onto your PDA or SmartPhone. For your private investigations inside your providers ip network we want to demonstrate you a tcp/udp port and round-trip-time based traceroute program based on the .NET compact framework. With the help of this program we want to analyse the anti voice-over-ip filters implemented by different cellular providers and show you some possibilities how to circumvent them _efficently_. So we don't just tunnel all the traffic through a VPN. But even when these filters become more sophisticated in the future we want to present some ideas how to defeat your right to talk via voice-over-ip whereever and whenever you want to. Abstract: Introductory opening session by Tim Pritlove and keynote speech on the 22C3 topic "Private Investigations" by Joi Ito. Abstract: In this presentation I'll present a series of unusual security bugs. Things that I've ran into at some point and went "There's gotta be some security consequence here". None of these are really a secret, and most of them are even documented somewhere. But apparently most people don't seem to know about them. What you'll see in this presentation is a list of bugs and then some explanation of how these could be exploited somehow. Some of the things I'll be talking about are (recursive) stack overflow, NULL pointer dereferences, regular expressions and more. Abstract: Civil disobedience is a fundamental human right in all democracies, and it has to be accessible for everyone. This includes the accessibility of politically laden technologies which have to be understandable and destructible. Many current technologies however refuse accessibility to lay people. Thus it becomes the ethical obligation of the technical expert to provide understanding and accessible means for the destruction of potentially dangerous technologies. Abstract: In this talk, we will introduce the audience to the concepts involved in static analysis, and different implementations of those concepts with advantages and disadvantages of each. We will show how the open source tool bugreport (http://bugreport.sf.net) implements these concepts and will demonstrate the tool finding exploitable bugs in real-world binaries. Abstract: In 1996, The Surveillance Camera Players started manifesting their opposition to the culture of surveillance by performing silent, specially adapted plays directly in front of CCTV cameras. 10 years after, their work is more relevant than ever. This talk will take you through artists' strategies to raise the debate on privacy, the society of the spectacle, the aftermath of September 11th, face recognition software, panopticism, electronic tagging, etc. Abstract: Websites like Wikipedia and Blogspot are increasingly being blocked by government-level firewalls around the world. Although many people use the Tor anonymity network to get around this censorship, the current Tor network is not designed to withstand a government-level censor. In this talk we describe a design for providing access to the Tor network that is harder to block. Abstract: Microsoft has proposed architectural principles ("7 Laws of Identity") to support convergence towards an inter-operable, secure, and privacy-enhancing plurality of identity systems - an "Identity Metasystem". This new concept presupposes that a single monolithic identity system for the Internet is neither practicable nor desirable. Abstract: Most modern futurism describes technology-driven futures: the nanotech future, the biotech future, etc. But there's also another future, just as or more possible: the future where technology is marginalized by social and cultural forces (such as the rise of fundamentalism as a political force in the US and Middle East). This lecture talks about how technology and design can help humanity avoid a grim future. Abstract: While many issues in web apps have been documented, and are fairly well known, I would like to shine some light on mostly unknown issues, and present some new techniques for exploiting previously unexploitable bugs. This lecture will not be an introduction to webappsec as many lectures are, so I will assume that everyone knows about common web vulnerabilities/exploits and why they are bad, and I will present a bunch of esoteric and previously unknown knowledge about how to exploit webapps, primarily those written in PHP, but some techniques are applicable to other languages, etc. Abstract: Oracle databases are the leading databases in companies and organizations. In the last 3 years Oracle invested a lot of time and engery to make the databases more secure, adding new features ... but even 2007 most databases are easy to hack. This talk will describe the current status, the typical problems in customer installations and the trends for the future for Oracle Security. I will show some scenarios how to attack (and prevent) databases, abuse Oracle security features (like Oracle Transparent Database Encryption (TDE)) and the latest trends in SQL Injection (e.g. why a table "!rm -rF /" sometimes executes code). Abstract: This talk will be similar to my unusual bugs talk last year. I'll present a couple of completely unrelated somewhat interesting and unusual things. Hence, a random collection of them. Mc Full Audio Converter 1.3.0 denial of service exploit that creates a malicious .ogg file. Abstract: It is thought by many that the world may be facing Peaks in fossil fuel production and catastrophic climate change. These huge problems put into question the Industrial Civilisation and call for, at the very least, massive changes to society if humanity is to survive. Do hackers have a role to play in a post transition society? What sort of things should hackers know and prepare for in such a future? Abstract: The process of exploiting kernel based vulnerabilities is one of the topics which have received more attention (and kindled more interest) among security researchers, coders and addicted. Due to the intrinsic complexity of the kernel, each exploit has been mostly a story on itself, and very little work has been done into finding a general modelization and presenting general exploiting approaches for at least some common categories of bugs. Moreover, the main target has usually been the Linux operating system on the x86 architecture. This talk reprises and continues the attempt done in this direction with the Phrack64 paper “Attacking the Core: Kernel Explotation Notes” that we released six months ago. A more in-depth discussion of some Solaris kernel issue (both on x86 and SPARC) and a more detailed analysis of Race Conditions will be presented. Abstract: "Guerrilla knitting" has a couple of meanings in the knitting community - to some, it merely means knitting in public, while to others, it means creating public art by knitted means. Contemporary knitters feel very clever for coming up with edgy language to describe their knitting, but the truth is that for decades there have been knitters and other textile artists who are at least as punk rock as today's needle-wielders. This talk will cover the vibrant history of contemporary knitting, with a focus on projects that will make you say, "Wow, that's knitted?" Feel free to bring knitting projects to the talk - let's get some public knitting going on at the conference! Abstract: The Open Source initiative re-interpreted Free Software to include it into the neo-liberal ideology and the capitalist economy - whose aims are contrary to the FS starting axioms/freedoms. This platform will focus on ideological and political aspects of this. It will also suggest FS recovery strategies. [Audio] What can we do to counter the spies? Abstract: A presentation about the role of intelligence agencies in the current era of the unending “war on terror”, how they monitor us, the implications for our democracies, and what we can do to fight back. In the name of protecting national security, spy agencies are being given sweeping new powers and resources. Their intelligence has been politicised to build a case for the disastrous war in Iraq, they are failing to stop terrorist attacks, and they continue to collude in illegal acts of internment and torture, euphemistically called “extraordinary rendition”. Most western democracies have already given so many new powers to the spies that we are effectively living in police states. As an informed community, what can we do about this? Abstract: Mifare are the most widely deployed brand of secure RFID chips, but their security relies on proprietary and secret cryptographic primitives. We analyzed the hardware of the Mifare tags and found weaknesses in several parts of the cipher. Abstract: DNS Rebinding has proved itself to be an effective mechanism for turning standard web browsers into proxy servers. This talk will go into further depth regarding mechanisms for hijacking browser connectivity, and will illustrate some new tricks for measuring network neutrality. Having already shown some basic aspects of this attack at previous conferences, we'll be expanding DNS rebinding to show demos not dependent on Flash - specifically, we'll be going after home routers that really, really need to stop having default passwords. Abstract: Happy digital world: Everything is information, and it grows by sharing. Scarcity seems to be a problem of the "meatspace". On the internet, there is space for everybody, for every activity and for every opinion. Really? This lectures explores the power of intellectual property rights, the principle of net neutrality and surveillance issues and explains their impact on everyday (digital) life. The net as we know it is in danger. What is needed to make it stay a resource which is valuable, open and free for everybody? How could a concept of digital sustainability look like? Abstract: Learn how to make cool things with microcontrollers by actually making fun projects at the Congress -- blink lights, hack your brain, move objects, turn off TVs in public places -- microcontrollers can do it all. Ongoing workshops each day of the Congress. Abstract: There are many open source tools available to do packet capturing and analysis. Virtually all networkers use these tools. However millions of packets per seconds are just too much for general-purpose hardware. This is a problem as 10 Gigabit networks allow for millions of packets per second. Abstract: I'm planning to look at how hackers and other "folks like us" get the "real world" to let us be crazy deviants, and continue to pay us anyway. Clearly not everyone is able to do this - hence the sort of person who says, "I'd love to [go to Burning Man] [blow things up] [dress eccentrically]" but never does any of it. But some of us are able to get the world to play along, and I am looking at that from a sociological point of view. [Audio] Why were we so vulnerable to the DNS vulnerability? Abstract: SSL wasn't enough. Encryption is nonexistent. Autoupdaters are horribly broken. Why is all this the case? Abstract: We demonstrate a complete break of the KeeLoq crypto-system. Thanks to Power Analysis, even non-specialists can gain access to objects secured by a KeeLoq access control system. Abstract: You are used to your mobile phone number following you around the globe. But the same functionality that makes you reachable worldwide can also be used to track your whereabouts down to city-level – without you ever knowing about it. Abstract: In this talk I present the current state of wearable computing, computing as common and useful as clothes, focusing on activity recognition (the inference of the users current actions) using on-body sensors (accelerometers, gyroscopes and other modalities), explaining possibilities, dealing with challenges and limitations and presenting some perils. [Audio] Opening and Keynote "Nothing to hide"
Abstract: This year's apocalyptic Fnord-review will include the war in Georgia and the financial-crisis. We try to web the events into a kind of mega-conspiracy, so that only one group (or probably two or three) are guilty. Abstract: Join a glorious gala presentation with his Excellency and a battalion of members of the Soviet Unterzoegersdorf Military Enforcement Community. We will present the envious "First World" with the fruits of our techno-labor. Among other triumphs on display will be the second part of an ongoing series of so-called "Computer Games" or "Virtual Hyper-Rooms" glorifying the struggles of the Motherland, Soviet Unterzoegersdorf: Sector II. We promise not to mention the SALT II agreement. Abstract: A collection of engaging techniques, some unreleased and some perhaps forgotten, to make pentesting fun again. From layer 3 attacks that still work, to user interaction based exploits that aren't 'clickjacking', to local root privilege escalation without exploits and uncommon web application exploitation techniques. Abstract: In the recent years, we observed a growing sophistication how credentials are stolen from compromised machines: the attackers use sophisticated keyloggers to control the victim's machine and use different techniques to steal the actual credentials. In this talk, we present an overview of this threat and empirical measurement results. Abstract: Small devices like microcontrollers, coupled to a few buttons, knobs, encoders and LEDs, allow for a host of interesting and creative musical applications. Solder a few bits together, program a few lines, and you can build a deep device to support your musical exploration. This lecture will show you quickly how the hardware and code works, and then focus on a few interesting applications: controllers, sequencers, sound generators. The workshop will allow you to build your own crazy ideas. Abstract: The topic of swarm robotics will be introduced, including the current state of the art and some current research platforms. The problems of scalability in robot swarms will be discussed, particularly of programming and maintaining a large group of robots. The Formica platform represents a novel, very low cost approach to swarm robotics. Its design and implementation will be described, and the lecture will culminate in a live demonstration of a swarm of 25 robots cooperating on a task. Abstract: Birds, glider pilots, and recently UAVs can exploit a variety of weather effects in order to gain altitude, remain airborne and travel long distances all with no power input – effectively, hacking the atmosphere to fly for free. This talk will explain the aircraft, techniques, meteorology, hardware and software that we use to achieve this. In the process I will show why the sport of gliding may be of interest to hackers, and explain how you too can get involved in this highly rewarding and low-cost form of flying. Abstract: This presentation will examine the largely underresearched topic of rich internet applications (RIAs) security in the hopes of illustrating how the complex interactions with their executing environment, and general bad security practices, can lead to exploitable applications. Abstract: This is not a hacking presentation, no vulnerabilities are presented. It's a crash-course in full-disk-encryption ("FDE") concepts, products and implementation aspects. An overview of both commercial and open-source offerings for Windows, Linux, and MacOSX is given. A (programmer's) look at the open-source solutions concludes the presentation. Abstract: 4 minutes for every speaker. Learn about the good, the bad, and the ugly - in software, hardware, projects, and more. Abstract: The breaking away of privacy in the digital world is often understood as something dangerous, and for good reasons. But could there be opportunities in it, too? Do the current cultural and technological trends only dissolve the protected area of privacy, or could they dissolve as well the pressures that privacy is supposed to liberate us from? What if we witness a transformation of civilization so profound that terms like "private" and "public" lose their meaning altogether? Maybe we won't need "privacy" at all in the future because we will value other, new liberties more strongly? Abstract: We are in the midst of a major global warming, as witnessed not just by temperature measurements, but also for example by the record loss of Arctic sea ice in 2007 and 2008. This year, both the Northwest Passage and the Northeast Passage in the Arctic were open for ships to pass through for the first time in living memory. Abstract: The talk will cover the past, present and future of Cisco IOS hacking, defense and forensics. Starting from the historic attacks that still work on less well managed parts of the Internet, the powerful common bugs, the classes of binary vulnerabilities and how to exploit them down to the latest methods and techniques, this session will try to give everything in one bag. Abstract: As more security features and anti-exploitation mechanisms are added to modern operating systems, attackers are changing their targets to higher-level applications. In the last few years, we have seen increasing targeted attacks using malicious Office documents against both government and non-government entities. These attacks are well publicized in the media; unfortunately, there is not much public information on attack details or exploitation mechanisms employed in the attacks themselves.